Commentary — A “Religious Turn” in Modern European Historiography? 1. The literature criticizing secularization theory or proposing alternative models of understanding religion and modernity has become quite extensive. The literature in sociology, previously a stronghold of secularization theory, is especially noteworthy. See Peter, Berger, ed., The Desecularization of the World: Resurgent Religion and World Politics (Grand Rapids, Mich.: Eerdmans, 1999), and, earlier, Hadden, Jeffrey K., “Toward Desacralizing Secularization Theory,” Social Forces 65 (1987): 587–611. With respect to modern Europe in particular, see Hervieu-Léger, Danièle, La religion pour mémoire (Paris: Cerf, 1993), and Davie, Gracie, Religion in Modern Europe: A Memory Mutates (Oxford: Oxford University Press, 2000). 2. See the collection of essays in Sterk, Andrea, ed., Religion, Scholarship, and Higher Education: Perspectives, Models, and Future Prospects (Notre Dame, Ind. : University of Notre Dame Press, 2002). 3. 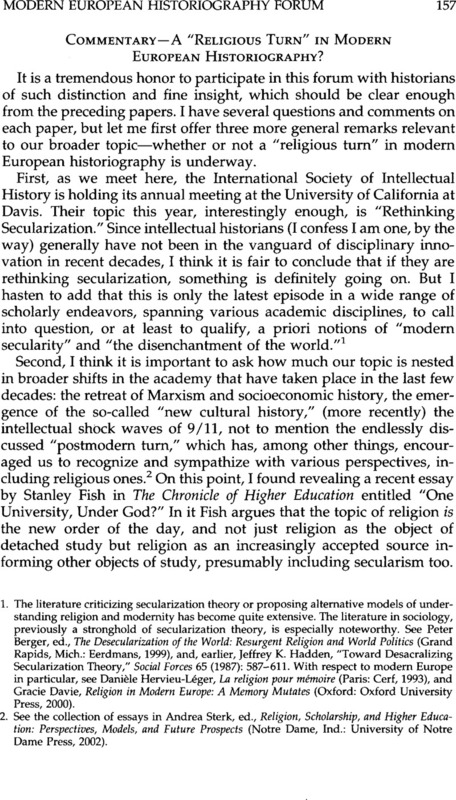 Fish, Stanley, “One University, under God?,” The Chronicle of Higher Education (7 January 2005): C4. 4. I have suggested an enormous bibliography. See, for example, Caroline, Ford, “Religion and Popular Culture in Modern Europe,” Journal of Modern History 65 (03 1993): 152–75; Blackbourn, David, “The Catholic Church in Europe since the French Revolution: A Review Article,” Comparative Studies in Society and History 33 (10 1991): 778–90; Hartmut, Lehmann, ed., Koexistenz und Konflikt von Religionen im vereinten Europa (Göttingen: Wallstein, 2004); Hartmut, Lehmann, ed., Religöser Pluralismus im vereinten Europa: Freikirchen und Sekten (Göttingen: Wallstein, 2005); and Hunter, Shireen T., ed., Islam, Europe's Second Religion (Westport, Conn.: Praeger, 2002). 5. I have especially benefited from Cox, , “Secularization and Other Master Narratives of Religion in Modern Europe,” Kirchliche Zeitgeschichte 14 (2001): 23–34. 6. Howard, Thomas Albert, “A ‘Religious Turn’ in Modern European Historiography?,” Historically Speaking 4 (06 2003): 25–26. I would qualify my criticism, however, by noting that a number of individual monographs in modern intellectual history suggest that religion is beginning to be dealt with more seriously. For example, see Sheehan, Jonathan, The Enlightenment Bible: Translation, Scholarship, Culture (Princeton, N.J.: Princeton University Press, 2005); Williamson, George S., The Longing for Myth in Modern Germany: Religion and Aesthetic Culture from Romanticism to Nietzsche (Chicago: University of Chicago Press, 2004); and Howard, Thomas Albert, Religion and the Rise of Historicism (Cambridge: Cambridge University Press, 2000), and Protestant Theology and the Making of the Modern German University (Oxford: Oxford University Press, forthcoming, 2006). 7. Cf. Davie, Gracie, Europe—The Exceptional Case: Parameters of Faith in the Modern World (London: Longman and Todd, 2002), and Lehmann, Harrmut, Säkularisierung: der europäische Sonderweg in Sachen Religion (Göttingen: Wallstein, 2004). 8. Cf. Lehmann, Hartmut, “A Plea for the Comparative Study of Religion in a Transatlantic Perspective,” in Lehmann, Alter und Neue Welt in wechselseitiger Sicht: Studien zu den transatlantischen Beziehung (Göttingen: Vandenhoeck and Ruprecht, 1995), 251–56; and Lehmann, Hartmut, “The Role of Religion in Germany and America in the Nineteenth and Twentieth Centuries,” in Bridging the Atlantic: The Question of American Exceptionalism in Perspective, ed. Elizabeth, Glaser and Hermann, Wellenreuter (Cambridge: Cambridge University Press, 2002), 69–81.